ISAF aircrews across Afghanistan haven’t been as busy as years before, according to new stats released by Air Forces Central Command. There were 382 close air support weapons releases in June, down from 521 during the same month last year. So far this year there have been 1,782 weapons releases, compared with 4,084 for all of last year. And it isn’t just airstrikes that have dropped. In 2013, there have been 294 casualty evacuation sorties, including 96 saves. Last year, there were 2,171 CASEVACs with 1,187 saves. 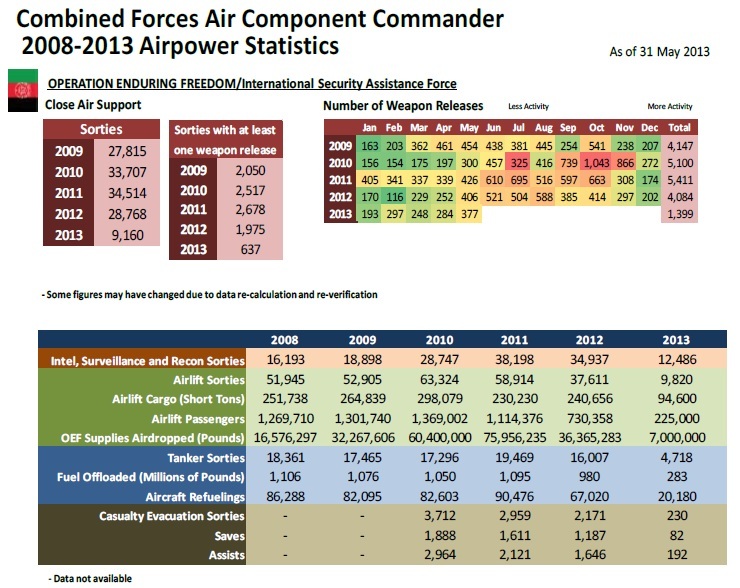 A full breakdown of ISAF air stats is available after the jump. AFCENT still is not releasing a breakdown of weapons releases by remotely piloted aircraft after abruptly reversing its decision to publicly release the stats earlier this year. US Central Command has said that the RPA stats are available by Freedom of Information Request. Our request is still pending.